Two roads races and one time trial makes for a long day of racing. It was a lot of fun, though, and I ended up getting 3rd in the Pro/1/2 road race, 3rd in the Masters 35+ road race, ? in the Pro/1/2 time trial, and ? in the Masters 35+ time trial. After racing two road races in the morning, thankfully we only had to race the time trial once to be scored in both categories based on our time. I wanted to post these stats because the Pro/1/2 road race and Masters road races played out so differently and yet I got the same place in each race. I was already thinking even before the end of the Masters road race that it was going to be really interesting to compare the data from the two races as well as the tactics and how everything played out. First, the pro/1/2 road race was a pretty small field, but it was quite strong. This meant that whenever somebody attacked, there was always somebody strong enough to bring it back together. The days action started out with Nate Robinson going solo and establishing a 1 minute+ lead. At some point the entire field got into a rotation, and we started to gradually close the gap. Then the attacking began. It’s hard to remember all the attacks because there were so many. I launched one attack that led to a good break with me, Christian Parrett (Globalbike), and Anders (Litespeed-BMW). We worked together really well and were absolutely drilling it, but the gap never got more than maybe 20 seconds. Anders teammate, Chris Brown, bridged up to us and even with the extra horse power, the rest of the field brought us back on the downhill/headwind section of the course. After the umpteenth attack was brought back on the last lap, we had about 5 or 6 miles of steady very slow riding. Then John Hart (Friends of the Great Smokies) put in the first attack to start the end game with about 3 or 4 miles left in the race. The sudden attack after several miles of slow riding meant that it was “cramp city” for me and probably a lot of other riders. I was able to fight the initial cramp and go with Anders when he countered John’s attack. After these late attacks, the field had been whittled down to just five riders – and we were at a stalemate going into the last mile. Christian put in the first attack with about 1K to go. Anders covered that move with me on his wheel. But then Anders stepped up the pace to lead out Chris. Christian ended up on Anders wheel, then Chris, then me. Christian started his sprint on the downhill leading to the finish. I was still in third position as we hit the bottom of the hill. The finish line seemed so close, and I was in perfect position so I attacked thinking that we had maybe 200 meters left. But after a few seconds into my sprint, we then crossed the 200 meter mark so I had gone too early and both Chris Brown and ? (Harpeth Bicycles) was able to come around with me taking third. The masters road race had a larger field of maybe 25 riders. I was still tired and very hot from the 8AM race which had gone longer than expected because of our slow average speed. I wanted to race conservatively to make sure that I could finish. Fortunately, there was an early break that got up the road. Also, fortunately, there were some strong riders/teams at the front that worked well together to slowly bring the move back after about a lap and a half. This meant that for the first 15 miles of the race, the pace was very smooth and I worked hard to make sure that I stayed out of the wind as much as possible. Towards the beginning of the 3rd lap, Chris Brown (Litespeed-BMW) launched a hard solo attack. I was in good position to cover so I drilled it as hard as possible and was able to catch up to him. At this point, there was a solo rider up the road and I figured that we would bridge up to him and have a break of three. But lo and behold, the field came charging up to us just as we starting to get into a rotation! We sat up and our pace dropped leaving the solo rider still close to a minute in front of the field. I’m not exactly sure what happened next, but only a couple miles later I ended up off the front with three other riders (Britton, Chris, and John). We drilled it hard, fully committed to the move and yet two riders were able to bridge up to us from the field (GW and somebody else). This meant we had a group of six chasing one guy. We worked well together as a group, caught the solo rider towards the end of that lap with one lap to go. Our group worked well together all the way to the end. This time in the sprint, I thought I would wait as long as possible and it worked pretty well as I had a ton of speed for the finish coming up hard on the winner (Britton) and second place – but it was too late as they had already crossed the line leaving me in third again. Two road races down and only one very short (1K) time trial to go. It turns out that there is a lot of strategy that goes into a 1K time trial – especially one that starts out at the bottom of an 11% hill, then crests to a false flat downhill with a massive tailwind. How hard do you go up the hill? How much do you need left in the tank for the false flat downhill with a tailwind? I decided ahead of time to meter my effort based on average wattage. I know that I can maintain 500 watts for over two minutes – so for a 1K effort that would take about a minute and a half, I was aiming for about 550 watts given the 100 miles of road racing that I had just done. I took one look at my power meter, however, saw 800 watts and decided not to look at the power meter anymore. I ended up with an average power just under 590 watts – so I was happy with that although I’m not sure how that will compare to everyone else. 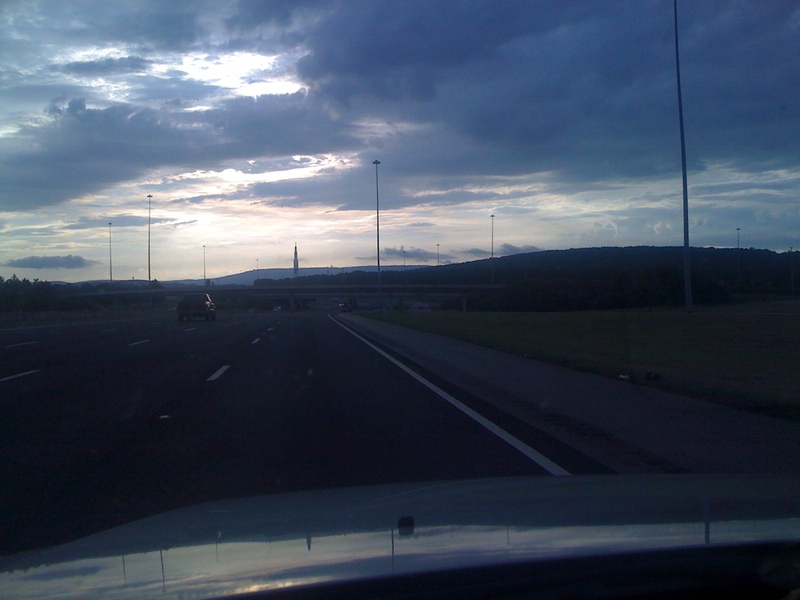 This entry was posted in Racing and tagged road race, time trial on July 14, 2012 by kartoone.